MT-NewsWatcher incorporates speech recognition capabilities, and is probably the first speech-controlled Usenet newsreader. Speech Recognition enables the program to respond to certain spoken commands, which is useful for those with disabilities and those who want a rest from the keyboard. 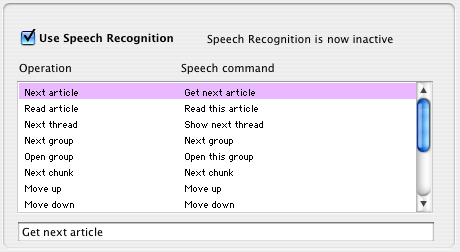 To start up Speech Recognition (abbreviated to SR) in MT-NewsWatcher, go to the Speech Recognition option in Preferences. Check the Use Speech Recognition box to enable SR. The scrolling list in that preferences panel shows you what commands are speakable, with the action on the left, and the speech string on the right (these are the words that you say to perform the action). You can edit the speech strings by clicking on a list item, tabbing to the edit field, and editing the text. When changing the speech commands, you should bear in mind that speech recognition is not foolproof. It is best to choose commands such that they sound as different as possible. For example, have two commands, "Get next article" and "Get next group", is not a good idea, because these two strings are difficult to distinguish. It would be much better to have "Get next article" and "Open next group". In group windows, you can speak the name of a group (without the dots, for example "comp sys mac apps") to open that group. Beware that the SR software is not good at differentiating between similar-sounding group names. When a subject window is open, you can (try to) speak the first few words of a subject to open that article. MT-NewsWatcher will open the first article of the thread, if the article is a thread member. If the Use Speech Recognition checkbox is not enabled in the prefs, check that the Speech Recognition software is installed and enabled. You must have version 1.5 or later of the Speech Recognition software installed. You also need a PlainTalk-capable microphone. If the computer does not register your spoken commands, check that the sound input is set to the microphone, in the Monitors and Sound control panel. The SR software does not work well with language model with more than a couple of dozen entries; when the model is built for the subject window, each visible article gets an entry. Thus, SR will work best in subject windows with 50 or less items. You can set the "Max articles to fetch" preference item to ensure that your subject windows do not get too big.